In what part of our galaxy do you live? Are you a full-time artist? I’m from a tiny town called Cleveland, about an hour north of Houston. Currently a cashier, but hopefully one day I’ll be full time! That’s the dream anyway. How long have you been a Star Wars fan? Can you recall your first Star Wars memory? Like everybody, my parents started me out early with the original trilogy. Then when The Phantom Menace came out I was 7 and had an unhealthy obsession with Jar Jar and wanted to be Queen Amidala. I remember making a ton of little drawings inspired by TPM, so in retrospect… I guess Star Wars is a big reason why I even started drawing! What did you think of Rogue One? Are you looking forward to the future standalone films? Obi-Wan for sure. But I have so many favorites. How did you begin creating Star Wars art? How would you define your style? The Force Awakens came along and I hadn’t been inspired like that in a long time. So it was great having something to pour all of the creative energy in to again. I’m honestly not sure! A lot of people say it’s “photorealism” but I don’t think that fits at all. I do try to keep a traditional portrait/oils look despite being digital. As an artist, what is something you’ve learned about the overall visual style of Star Wars? Oh goodness, it has this wonderful color scheme of all the best colors. A while back I’d noticed very particular colors going in my SW art without purposely doing it. I was making an art dump on and it hit me that they all match, save for maybe a couple. So, I’m very much a fan of the Star Wars color scheme. Do you have any favorite artists or influences in your work? Man, I have such an awesome friend circle that also happens to be artists that I absolutely adore. Pulp fiction illustrations and movie posters from the 50s/60s are something I aspire to… Robert McGinnis, Jon Whitcomb, Tom Lovell, and Jim Schaeffing are some of my favorites. I love Toru Kamei, Shaun Richards, and Nicola Samori too. Which is your favorite Star Wars character to create art of? So far: Poe, Obi-Wan or Kylo. Maul is really fun too. Which are your favorite Star Wars art pieces that you have made? 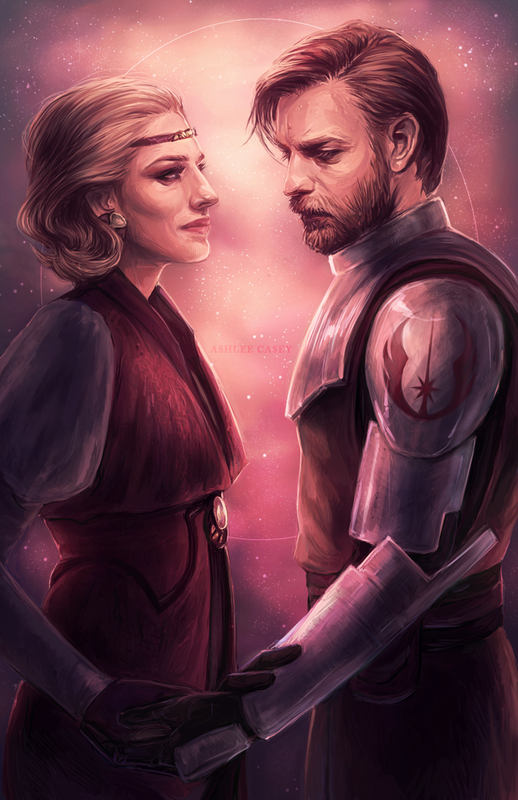 I’m pretty proud of this Satine and Obi-Wan picture I did. I like my first portraits of Poe and Kylo alright too. How do you usually go about making your art? What’s your process/timeline from start to finish? Usually I have to be in a certain mood. If I try to make myself art and I’m not feeling it, it’s so bad. It kind of varies, sometimes I’ll go in with a plan and other times I just kind of see where it goes. Same thing with timeline, I’ve made some of my best in just several hours, but others might take me days to finish. Are you working on more Star Wars art? or have some planned for the future? I am! I have portraits of Lando, Han, and Leia needing to be finished. Dying to make more Clone Wars art, mostly Ahsoka… I can’t wait to make something of her that isn’t just a little sketch. Got a lot of ideas brewing! How excited are you for The Last Jedi? What questions do you hope are answered? Jeez. Honestly I can’t even put in to words how excited I am. There’s so many questions I have, but we all know the real burning question… why did Carrie have to slap Oscar 27 times for a scene? To see more of her awesome Star Wars (and Walking Dead) art, follow her on Facebook, Twitter, and Instagram.